From the songs of Schubert & Gershwin to myths and dances of contemporary Japan, Aaron explores the sounds, poetry and aesthetics of classical music from the East & West by American and Japanese composers. The culmination is Aaron's acclaimed CD ‘The Legend of Hagoromo’ (Stone Records, 2015). Bach compositions rarely heard on guitar is a recent project of Aaron's. Aaron's first Bach arrangement, a mash-up of three versions of a fugue, was begun in 2014. Since then he has arranged a series of small preludes and fugues, numerous WTC Preludes, cantata movements, and the Chromatic Fantasy and Fugue. 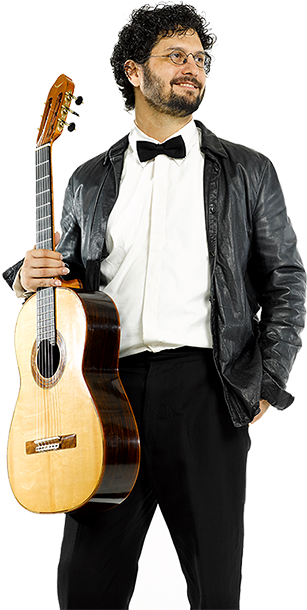 His all-Bach programs include a few Bach guitar standards as well. Aaron explores the early and mid-career lyrical music of John Cage. Begun in 2013 with his arrangement of 'Six Melodies', the endeavor has since seen the publication of 'Six Melodies', 'Piano Music Arranged for Guitar' and soon 'Bacchanale' for two guitars prepared. A disc 'John. Cage. Guitar.' was issued by Stone Records in November 2018. Click HERE for album and publication information. Music by composers from around the world from Aaron’s acclaimed New Lullaby Project. Started in 2007 as a non-intimidating way to introduce composers to the guitar and audiences to contemporary music, Aaron has since premiered 55 'New Lullabies', released a disc, and recorded even more. All New-Lullaby concerts have taken place in Moscow, Russia, Boston, Mass., and rural New Hampshire and Oregon. Bowdoin college composer Vineet Shende and Aaron Larget-Caplan collaborate in an exploration of Bach’s Well-Tempered Clavier and Indian ragas through Shende’s Carnatic Preludes, After J.S. Bach re-imaginings of some of the famed WTC Preludes in a South Indian musical language. Each Carnatic Prelude is paired with Larget-Caplan’s artistic transcription of the original keyboard prelude arranged for guitar. Begun in 2017, 3 premiered by 2018. New England States Touring Grant Program Aaron Larget-Caplan is a roster artist for the New England Foundation for the Arts' New England States Touring Grant program! Fee support for public performances or education/outreach programs may be available to nonprofit organizations in ME, NH, VT, MA, RI, and CT. Visit www.nefa.org for more information. 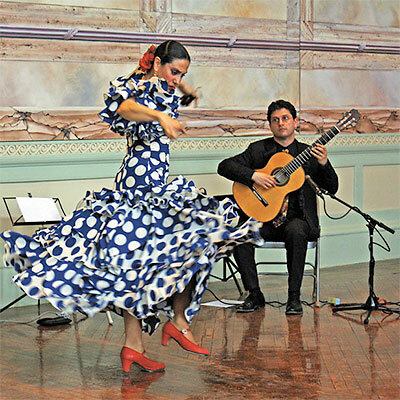 Virtuoso guitar, hypnotic dance, silky castanets & splendid costumes come together for a riveting night of Spanish dance & song. Composers: Albéniz, De Falla, Tarrega, Rodrigo, Sanlucar, Nuñez. A commissioning, performance, and recording endeavor that bridges the fear and intimidation that audiences have towards 'new music' and that composers feel for writing for the guitar, for "Who's Afraid of a Lullaby?!" Composers from 8 countries represented: France, USA, Japan, Russian, Norway, Poland, Afghanistan, and Australia. Lullabies in various musical languages: tonal, minimalist, 12-tone, quarter-tone, and polyphonic. 1 album of 14 New Lullabies released in 2010. 17 recorded to date. A second recording is planned for 2020. All-New Lullaby concerts given in Moscow, Russia, Oregon, Boston, Salem, and New Hampshire with pajamas, hot chocolate, and pillows for kids. Late-night version for college students and adults. Educational and entertaining cultural events exploring cultures, languages, learning, and the guitar for students and listeners of all-ages. 45"-1hr in length, these interactive concerts are often performed in school classrooms or in assemblies, community settings, or as part of a larger cultural arts residency. Explore the sounds and secrets of night-music through compositions written for award winning classical guitarist Aaron Larget-Caplan’s New Lullaby Project. 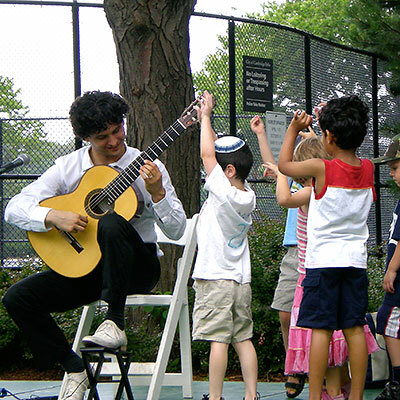 Musical introductions, composer stories, and guitar listening secrets glitter the interactive program and introduce young listeners to the classical guitar and contemporary composition languages using the traditional genre of the lullaby. About AaronAaron has been creating educational and entertaining young people programs with “Bernstein-like ease” alongside his formal concert career for close to 20-years, introducing classical and modern music in cities, rural regions of Oregon, New Hampshire, and Russia. Recent past performances and residencies include ICA-Boston, Art Alliance of Northern New Hampshire, Young Audiences of Massachusetts, Cannon Beach Theater, Hartford Performs and many more. In conjunction with concerts, Aaron regularly gives master classes and workshops to students at conservatory or university as well as beginners. His lectures often include performance and can be a wonderful introduction to the guitar or a means to delve further in its exploration. 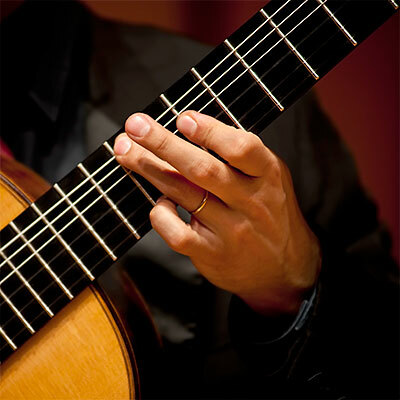 The master classes focus on body mechanics, sound production, music history and style, guitar technique (classical, flamenco and contemporary) as well as arranging.